Shrimps protect the polyp tile they are on from attack, plus any other polyp tile that is orthogonally adjacent to that polyp tile and which is part of the same coral. Shrimps will not protect an adjacent polyp that is part of a different coral. The arrows in the diagram show those polyps that are protected by the shrimps. 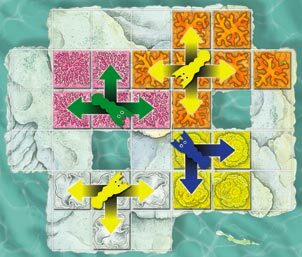 Shrimps may be moved from a polyp tile onto a bare rock during a player's turn, however a shrimp must be placed onto a polyp tile before the end of that player's turn or it must be returned to behind the player's screen. Two shrimps can never be on the same coral. Players may not at any time have more than two of their own shrimps on one rock. Shrimps which have not yet been played are kept behind a player's screen. A player is not obliged to state how many shrimps they still have behind their screen if asked.